Do you want Good Feet or AMAZING FEET? If you have plantar-fasciitis, foot pain, knee pain or back pain OR if you want to prevent these issues in the future, we can help! Our Certified Orthotists, Steve Brill and Chris Gearhardt and Certified Pedorthist, Tammy Daulton provide excellent advice and care that helps our clients get back on their feet and feel AMAZING! The Bioworks staff will determine insurance coverage and pre-certification requirements. If pre-certification is required, Bioworks will submit the request at that time. If insurance will not cover foot orthotics, Bioworks has competitive self-pay options. We can only submit to insurance if you have a prescription, otherwise we will process as self-pay. We’ll schedule you back for a fitting of your custom orthotics fabricated in our office within 1-2 weeks, which takes about 30 minutes. If any issues arise, you can call to schedule an adjustment appointment. Adjustments are included for the life of your orthotics, which is generally 2-4 years depending on activity level. What issues can be improved with shoe inserts or arch supports? Foot orthotics are often called shoe inserts are arch supports. There are many problems that can be treated with foot orthotics. Heel Pain or Plantar Fasciitis – when our patients complain of heel pain, it is most often caused by plantar fasciitis. The plantar fascia is connective tissue that connects the bones of the foot. It makes the arch and holds the bones in place. If it is not taken care of early, a spur can develop (which leads to more pain and problems). A Spur is a piece of bone that develops from trauma). An X-ray can determine if a spur has developed. Knee Pain can be caused by problems in the feet. If a person has changed their walk this causes problems all the way up the leg, so many knee issues can be treated with foot orthotics. We can usually tell if knee pain can be treated with foot orthotics just by watched our patients walk. Foot pain or foot Injuries – Foot orthotics are a treatment option for many patients who have experienced a foot injury playing a sport or at work. Overuse/Misuse – We find that people often don’t wear supportive shoes, but have to be on their feet often. This leads to foot pain and could lead to knee pain and back pain. Are You Ready for Amazing Feet? You can Request an Appointment Online. We carry a pre-made foot orthotic that works for many of our patients. These are a $50 charge out of pocket (you are able to use an HSA card for this purchase). Worker’s Compensation will often pay for these if the treatment applied to the injury. If your foot pain started recently a pre-made insert may be the right option for you. 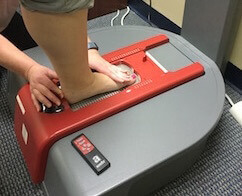 If your doctor prescribes a custom foot orthotic (CFO) or if you are experiencing severe foot pain, an assessment is needed. It takes about 30 minutes to get all the information we need to build the custom inserts. We have several tests to increase accuracy so the inserts fit well and improve the situation. It takes one to two weeks to make custom foot orthotics (CFO). Patients then come back for a 30-minute visit to fit them. As with any foot orthotics, we recommend easing into them to allow the body time to get used to them and to avoid more foot pain. Some patients prefer a “low-profile” orthotic. Your shoe insert should fit the shoes you wear the most, so we have an option for patients who wear dress shoes. These inserts are not made in our lab, so it may take longer to begin the treatment. This is not the option we recommend in most cases because the insert does not support the entire foot. Sometimes we need to have a mold made to get the right shape for the patient. It takes two weeks for these to be made. If this option is necessary we use box foam to make a mold of the patient’s foot. This option is mostly used in cases of diabetes, deformities or very severe foot pain. Does Insurance Cover Shoe Inserts? In some rare cases, insurances will cover shoe inserts for plantar fasciitis and other conditions, but if there is a case where they are not covered we do offer competitive self pay rates. Our evaluation is free and our total cost is includes the office visits, fittings, and adjustments. Any adjustments to your inserts are covered for the life of the orthotics (usually 2-4 years).We have various types of arch supports and will help you determine which option is the best for your situation. 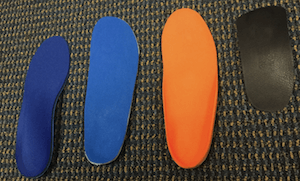 How much are Custom Foot Orthotics? Depending on the complexity of the foot orthotic we bill insurance $400-$450, but we also have options for if insurance does not cover foot orthotics. After 2 weeks, most patients feel a dramatic difference, but if relief is not attained after two weeks, there is a reassessment that includes adjustments to the insert or a different treatment as seen fit by the orthotist or pedorthist. If an adjustment is needed, there is no cost for these changes for up to two years for the same treatment. Do you have Questions about Foot Orthotics? Call Us or Complete our Contact Form.